Why should the Nexus 5 have all the Lens Blur fun? The new Google Camera app finally brings features that were once only available on Nexus devices to every other Android snapper out there. Well, as long as those Android devices are running KitKat, that is. 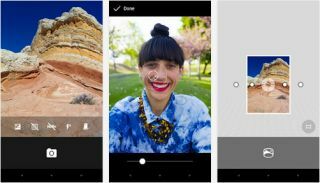 Two of the app's biggest features are Photo Sphere and Lens Blur. If you're remotely familiar with the Nexus 5, or even the Nexus 4 that came before it, Photo Sphere is definitely not a new trick, but it was very limited in terms of who could use it. Photo Sphere allows you to create panorama-like images with a 360-degree field of view. That means you're not limited to just panning straight across a scene, but you can move your phone camera up or down to include more of the sky and foreground. The stitching job on the 360 panoramas is pretty good, or at least as good as it can be on a really difficult image to piece together. And you'll be able to view them in full on your Android device or on Google+ if you want to share the photos. The next notable feature is Lens Blur, which is similar to what you'll find on the HTC One and the Samsung Galaxy S5. Basically, you select your subject and everything else gets blurred out so the focus is mostly on your subject. It's like shooting with shallow depth-of-field on a DSLR. These photo blurring effects sometimes work very well, and other times they seem very artificial. When it's done right, the results can be dreamy and natural. On the other hand, if it's a little overdone - like it is on the HTC One compared to the Galaxy S5 - it can look a little gimmicky. However, if you use it sparingly and carefully, you can get pretty good results and really show your subject and get rid of all the clutter in your photo. In the end, the Google Camera app is pretty simple, and the UI is designed to make taking photos easier. You can download it via the Play Store now if you're sporting a device with Android 4.4 KitKat. Enjoy! HTC One (M8) vs Samsung Galaxy S5 - Fight!